The passenger boarding bridge market is projected to grow from USD 750.0 Million in 2016 to USD 1,078.0 Million by 2021, at a CAGR of 7.5% during the forecast period. Increasing passenger traffic at airports and modernization programs are expected to drive the market during the forecast period. In recent years, increasing passenger traffic and concerns about the turnaround time of aircraft at airports have driven more airports agencies to procure passenger boarding bridges for boarding purposes. Owing to these factors, airport agencies and governments, of various countries have invested more in procuring advanced passengers boarding bridges, including apron drive, commuter, nose-loader and t-bridges. This report covers the forecast of the passenger boarding bridge market and its dynamics over the next five years, along with recognizing market application gaps, recent developments in the market, and high potential countries. The market has been analyzed primarily on the basis of application (airports, seaports) between 2016 and 2021, with 2015 as the base year. The report also analyses opportunities in the market for stakeholders by identifying key market trends, along with comprehensive analysis of market share and core competencies of key players to track competitive developments, such as joint ventures, mergers, acquisitions, research and development activities in the passenger boarding bridge market. Market size estimations for various segments and subsegments of this market were arrived at through extensive secondary research, corroboration with primaries, and further market triangulation with the help of statistical techniques using econometric tools. All percentage shares, splits, and breakdowns were determined using secondary sources and verified through primary sources. All possible parameters that affect the market covered in this research study have been accounted for, viewed in extensive detail, verified through primary research, and analyzed to arrive at the final quantitative and qualitative data. This data is consolidated and added with detailed inputs and analysis from MarketsandMarkets and presented in this report. The ecosystem of the passengers boarding bridge market comprises manufacturers, distributors, and end users. Key end users of the passengers boarding bridge market are airports, seaports and governments of several countries. Some of the key players in the market are JBT Aero Tech (U.S.), ThyssenKrupp AG (Germany), CIMC Group Ltd (China), and Adelte Group S.L (Spain), among others. 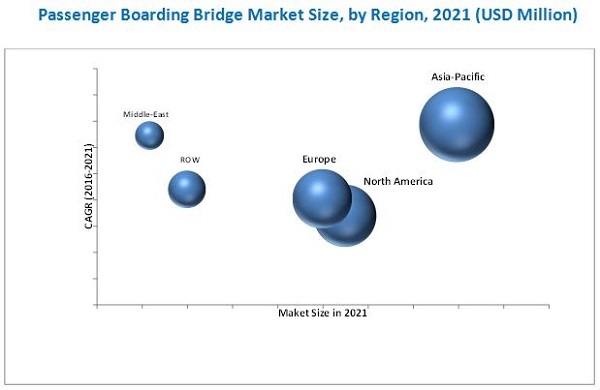 These players are adopting strategies such as new product launches, long-term contracts, and acquisitions to strengthen their positions in the global passenger boarding bridge market. They are also focusing on investing considerable amount of their revenues on R&D to introduce such bridges with advanced technologies and reduced weight. The global passenger boarding bridge market is projected to grow from USD 750.0 Million in 2016 to USD 1,078 Million by 2021, at a CAGR of 7.5% during the forecast period. Factors such as modernization of existing airports and refurbishment of existing equipment, and increasing passenger traffic are expected to drive the global passengers boarding bridge market between 2016 and 2021. 15.3 John Bean Technologies Corp.
15.9 Hubner GmbH & Co. Kg.